Thanks to the girls at Card Maker for inviting us to hop with them! I hope you have been inspired by everyone's creations! So now it is my turn! What fun - animal fur! 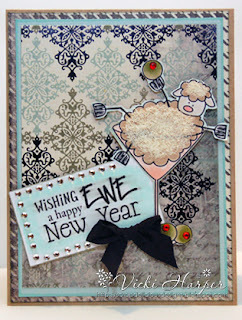 I was browsing over at Whimsie Doodles Stamps and found the perfect stamp for a FUN New Years Card! 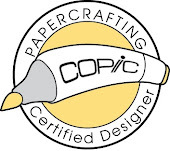 I used Ivory Flower Soft , Copic Markers, We R Memory Keepers Antique Chic line of papers and a little bling! Doesn't this card ring in the New Year?!! Thanks for stopping by! I hope you had a great time with our hop! Love this, Vicki! Great image and beautiful card! Such a cute card here too. EWE---so cute! love this fun holiday greeting! what a cute NY card! super cute card Vicki!! love it! So cute! Love the blingy pimientos! What a fun, punny greeting! This is so fun! Love your adorable image. Great idea for the Flower Soft!